151 in stock Need More ? A perennial bestseller in the wizarding world and one of the most popular books in the Hogwarts School library, Quidditch Through the Ages contains all you will ever need to know about the history, the rules - and the breaking of the rules - of the noble sport of Quidditch. 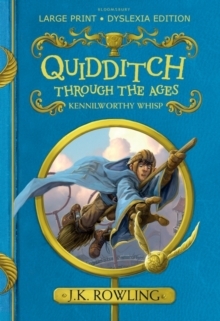 Packed with fascinating facts, this definitive guide by the esteemed Quidditch writer Kennilworthy Whisp charts the game's history from its early origins in the medieval mists on Queerditch Marsh through to the modern-day sport loved by so many wizard and Muggle families around the world. With comprehensive coverage of famous Quidditch teams, the commonest fouls, the development of racing brooms, and much more, this is a must-have sporting bible for all Harry Potter and Quidditch lovers, whether the weekend amateur or the devoted Chudley Cannons fanatic. This large print, dyslexia-friendly edition of the most famous sports book in the wizarding world pairs J.K.
Rowling's original text with gorgeous jacket art by Jonny Duddle and line illustrations throughout by Tomislav Tomic. Features to aid accessibility include RNIB-approved and dyslexia-friendly fonts and font sizes, tinted paper for glare reduction and maximum contrast, captions and detailed descriptions to accompany each illustration and themed navigational aids to assist the reader. A contribution from the sale of each book will go to Comic Relief and Lumos.